Dimitris Kletsas is Research Director, Head of the Laboratory of Cell Proliferation and Ageing and Director of the Institute of Biosciences and Applications in the National centre for Scientific Research “Demokritos” in Athens. He graduated from the University of Thessaloniki, Greece, and received his PhD from the University of Athens. 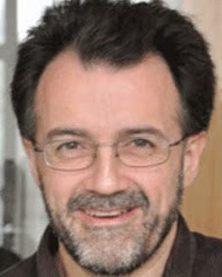 He was a post-doctoral fellow in EMBL, Heidelberg; NCSR “Demokritos”, Athens and Imperial College, London. Since 1999 he is a staff member in NCSR “Demokritos” and Head of the Laboratory of Cell Proliferation and Ageing and since 2017 Director of the Institute of Biosciences and Applications. His research has generated 160 papers in peer-reviewed journals and 16 book chapters, which have received more than 8000 citations and an h index of 43 (google scholar). He is a member of the Editorial Board of 9 Journals in the fields of ageing and tissue repair. He is currently President of the Hellenic Society of Biochemistry and Molecular Biology (HSBMB), he served as a President of the European Tissue Repair Society (ETRS) and was an Associate Member of the National council of Research and Technology and National Expert for FP6 for Health Sciences.